Augmented and virtual reality are still new, but they may soon write a new chapter in health care. The arrival of powerful handheld devices such as tablets and smartphones that can manage and utilize these technologies has fueled their rapid acceptance and integration, and they stand to revolutionize how we share experiences with each other and our surroundings. Just as the internet has revolutionized the way we share information, these new interfaces will impact how we learn, telecommute, and interact across boundaries—both physical and metaphorical—and make the world smaller than it is now. Others consider mixed reality synonymous with merged reality, which is defined by interactions with a virtual object having an impact on a real object. For instance, in IR, some new developers are creating virtual fluoroscopy suite control panels that maximize the sterility of the procedure by removing the need for a physical sterile barrier. Clinical medicine is increasingly reliant on imaging, and these programs can be useful for integrating radiology into anatomy education. There have also been developments in mobile AR applications, which can offer more convenience in learning anatomy.10,11 With the cultural trend of increased reliance on tablets and smartphones, mobile AR could be an attractive option in modernizing medical education. Studies evaluating the use of VR and AR for learning anatomy show that students find VR and AR applications to be enjoyable, effective, and valuable resources.8,12 Although the technology appears promising, data showing improved learning outcomes compared with traditional methods are lacking.8,12-14 Currently, major limitations to adoption of AR applications in education include availability of hardware, paucity of AR anatomy content, and lack of instructors familiar with the technology.11,14 This technology is still in its infancy, and further studies are needed to establish its utility and effectiveness. The examples presented here demonstrate potential roles for AR in medical procedural training. We note, however, that these AR systems have only been trialed in select groups of trainees and will likely require further validation before they are widely adopted. Neurosurgical procedures encompass a wide variety of interventions including spine, intracranial, endovascular, and endoscopic interventions.19,20 These procedures often carry high risks with low margins for error. Competency in these procedures requires extensive and rigorous training. Several AR and VR simulator systems have been described for neurosurgical procedures such as tumor resection, burr hole drilling, ventriculostomy, endoscopic navigation transoral robotic surgery, and orbital tumor resection.21-25 Simulation practice allows trainees to gain experience in complex and/or risky procedures while mitigating potential patient harm. Although there is emerging evidence for the benefits of simulation in surgical training, it is not certain that simulator proficiency will translate into the operating room.26 More robust data are needed to establish how AR/VR simulations affect trainee competence in the real world. The potential benefit of intraprocedural AR tools is beginning to be investigated as well. The feasibility of AR in percutaneous spine procedures has also been demonstrated in living humans.29 Abe and colleagues showed that AR can assist in vertebroplasty in a clinical trial but also confirmed the limitations of registration in actual patients, particularly for more complex anatomy.29 Decreased fluoroscopy time and, hence, decreased radiation exposure for the patient and clinician is consistently cited as an advantage to the use of intraprocedural AR. Mixed reality applications can improve visualization of deep, complex, and/or obscure structures for neurosurgery. To date, however, there are no prospective studies showing a significant difference, such as improved clinical outcome or decreased complication rates, between AR-aided surgeries and surgeries using conventional navigation systems.33 One advantage of AR use is decreased fluoroscopy times associated with AR-assisted procedures. Limitations in user interface and image registration remain obstacles in the wider adoption of AR intraprocedurally. For the time being, the advantages of patient safety and training accessibility make AR/VR simulators attractive adjuncts in neurosurgery training while we understand and address the technical barriers to intraprocedural use of AR in neurosurgery. Mixed reality and AR systems have been shown to provide a more intuitive understanding of surgical anatomy and assist in orthopedic hardware placement, for example, in cases of screw placement in percutaneous fixation of pelvic fractures or for sacroiliac joint fusion.34,35 Such advances may also allow for reductions in radiation dose to the patient and operator as well as decreased operating times by decreasing the number of attempts required to achieve fixation. CT-guided renal biopsy may be problematic if the renal mass is inconspicuous on noncontrast-enhanced CT. In the presence of other more readily identifiable lesions on noncontrast exam and, in particular, if low-dose scanning protocols are utilized, this could lead to a nonrepresentative biopsy. The literature reports rates of nondiagnostic biopsy up to 21% and nonrepresentative biopsy up to 11%.57,58 This affords a unique opportunity for AR navigation, if it were possible to overlay the conspicuous, contrast-enhanced lesion from a previous examination. This could not only improve diagnostic yield but also prevent the need for reinjecting contrast during the biopsy procedure. To the best of our knowledge, there are no studies addressing these clinical questions. 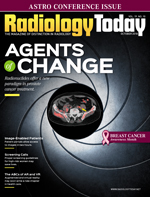 The field of radiology has always been at the tip of the spear when it comes to technological advancement. The rate of current technological change has the potential to be dislocating to many industries and medical specialties. It is vitally important that we, as radiologists, continue to explore these developing technologies and their possible use cases to ensure that we optimize them for the best outcomes for our patients and our specialty continues to thrive in the years and decades to come. — Daniel A. Ortiz, MD, is a musculoskeletal imaging fellow at the University of California, San Diego. — Vivek Kalia, MD, MPH, MS, is an assistant professor of radiology in the division of musculoskeletal radiology at the University of Michigan School of Medicine. — Theresa H. Nguyen, MD, is a radiologist at Ochsner Health System in New Orleans. — James Vogler IV, MD, is a radiology resident at Eastern Virginia Medical Center in Norfolk, Virginia. — José Morey, MD, is a radiologist and the chief medical informatics officer of Liberty BioSecurity. — Neil U. Lall, MD, is a radiologist at Ochsner Health System in New Orleans. — Jan Fritz, MD, is an associate professor of radiology and radiological science at the Johns Hopkins University School of Medicine. — Falgun H. Chokshi, MD, MS, DABR, is an assistant professor in the department of radiology and imaging services at the Emory University School of Medicine. — Korak Sarkar, MD, is a neurologist at Ochsner Health System in New Orleans. 1. Worldwide spending on augmented and virtual reality expected to double or more every year through 2021, according to IDC. IDC website. https://www.idc.com/getdoc.jsp?containerId=prUS42959717. Updated August 3, 2017. 2. Milgram P, Colquhoun H, Jr. A taxonomy of real and virtual world display integration. University of Toronto website. http://etclab.mie.utoronto.ca/publication/1999/Milgram_Colquhoun_ISMR1999.pdf. Published 1999. 3. LaValle SM. Virtual Reality. 2017. Urbana, Illinois: University of Illinois; 2016. 4. National Research Council. Virtual Reality: Scientific and Technological Challenges. Washington, DC: The National Academies Press; 1995. 5. Thomas RG, John NW, Delieu JM. Augmented reality for anatomical education. J Vis Commun Med. 2010;33(1):6-15. 6. Blum T, Kleeberger V, Bichlmeier C, Navab N. Mirracle: an augmented reality magic mirror system for anatomy education. Technische Universität München website. http://campar.in.tum.de/pub/blum2012vr/blum2012vr.pdf. Published 2012. 7. Ma M, Fallavollita P, Blum T, et al. Kinect for interactive AR anatomy learning. Paper presented at: IEEE International Symposium on Mixed and Augmented Reality (ISMAR); October 1, 2013. 8. Kugelmann D, Stratmann L, Nuhlen N, et al. An augmented reality magic mirror as additive teaching device for gross anatomy. Ann Anat. 2018;215:71-77. 9. Hamza-Lup FG, Santhanam AP, Imielińska C, Meeks SL, Rolland JP. Distributed augmented reality with 3-D lung dynamics — a planning tool concept. IEEE Trans Inf Technol Biomed. 2007;11(1):40-46. 10. Jain N, Youngblood P, Hasel M, Srivastava S. An augmented reality tool for learning spatial anatomy on mobile devices. Clin Anat. 2017;30(6):736-741. 11. Kucuk S, Kapakin S, Goktas Y. Learning anatomy via mobile augmented reality: effects on achievement and cognitive load. Anat Sci Educ. 2016;9(5):411-421. 12. Moro C, Stromberga Z, Raikos A, Stirling A. The effectiveness of virtual and augmented reality in health sciences and medical anatomy. Anat Sci Educ. 2017;10(6):549-559. 13. Hu A, Wilson T, Ladak H, Haase P, Doyle P, Fung K. Evaluation of a three-dimensional educational computer model of the larynx: voicing a new direction. J Otolaryngol Head Neck Surg. 2010;39(3):315-322. 14. Kamphuis C, Barsom E, Schijven M, Christoph N. Augmented reality in medical education? Perspect Med Educ. 2014;3(4):300-311. 15. Botden SM, Jakimowicz JJ. What is going on in augmented reality simulation in laparoscopic surgery? Surg Endosc. 2009;23(8):1693-1700. 16. Lahanas V, Loukas C, Smailis N, Georgiou E. A novel augmented reality simulator for skills assessment in minimal invasive surgery. Surg Endosc. 2015;29(8):2224-2234. 17. Rochlen LR, Levine R, Tait AR. First-person point-of-view-augmented reality for central line insertion training: a usability and feasibility study. Simul Healthc. 2017;12(1):57-62. 18. Wang S, Parsons M, Stone-McLean J, et al. Augmented reality as a telemedicine platform for remote procedural training. Sensors (Basel). 2017;17(10). 19. Soeiro J, Claudio AP, Carmo MB, Ferreira HA. Visualizing the brain on a mixed reality smartphone application. Conf Proc IEEE Eng Med Biol Soc. 2015;2015:5090-5093. 20. Hou Y, Ma L, Zhu R, Chen X. iPhone-assisted augmented reality localization of basal ganglia hypertensive hematoma. World Neurosurg. 2016;94:480-492. 21. Scolozzi P, Bijlenga P. Removal of recurrent intraorbital tumour using a system of augmented reality. Br J Oral Maxillofac Surg. 2017;55(9):962-964. 22. Lemole GM, Jr, Banerjee PP, Luciano C, Neckrysh S, Charbel FT. Virtual reality in neurosurgical education: part-task ventriculostomy simulation with dynamic visual and haptic feedback. Neurosurgery. 2007;61(1):142-148; discussion 8-9. 23. Alaraj A, Charbel FT, Birk D, et al. Role of cranial and spinal virtual and augmented reality simulation using immersive touch modules in neurosurgical training. Neurosurgery. 2013;72(Suppl 1):115-123. 24. Choudhury N, Gélinas-Phaneuf N, Delorme S, Del Maestro R. Fundamentals of neurosurgery: virtual reality tasks for training and evaluation of technical skills. World Neurosurg. 2013;80(5):e9-e19. 25. Mazur T, Mansour TR, Mugge L, Medkour A. Virtual reality-based simulators for cranial tumor surgery: a systematic review. World Neurosurg. 2018;110:414-422. 26. Borgersen NJ, Naur TMH, Sørensen SMD, et al. Gathering validity evidence for surgical simulation: a systematic review. Ann Surg. 2018;267(6):1063-1068. 27. Elmi-Terander A, Skulason H, Söderman M, et al. Surgical navigation technology based on augmented reality and integrated 3D intraoperative imaging: a spine cadaveric feasibility and accuracy study. Spine (Phila Pa 1976). 2016;41(21):E1303-e1311. 28. Ma L, Zhao Z, Chen F, Zhang B, Fu L, Liao H. Augmented reality surgical navigation with ultrasound-assisted registration for pedicle screw placement: a pilot study. Int J Comput Assist Radiol Surg. 2017;12(12):2205-2215. 29. Abe Y, Sato S, Kato K, et al. A novel 3D guidance system using augmented reality for percutaneous vertebroplasty: technical note. J Neurosurg Spine. 2013;19(4):492-501. 30. Besharati Tabrizi L, Mahvash M. Augmented reality-guided neurosurgery: accuracy and intraoperative application of an image projection technique. J Neurosurg. 2015;123(1):206-211. 31. Cutolo F, Meola A, Carbone M, et al. A new head-mounted display-based augmented reality system in neurosurgical oncology: a study on phantom. Comput Assist Surg (Abingdon). 2017;22(1):39-53. 32. Bong JH, Song HJ, Oh Y, Park N, Kim H, Park S. Endoscopic navigation system with extended field of view using augmented reality technology. Int J Med Robot. 2018;14(2). 33. Meola A, Cutolo F, Carbone M, Cagnazzo F, Ferrari M, Ferrari V. Augmented reality in neurosurgery: a systematic review. Neurosurg Rev. 2017;40(4):537-548. 34. Lee SC, Fuerst B, Tateno K, et al. Multi-modal imaging, model-based tracking, and mixed reality visualisation for orthopaedic surgery. Healthc Technol Lett. 2017;4(5):168-173. 35. Wang H, Wang F, Leong AP, Xu L, Chen X, Wang Q. Precision insertion of percutaneous sacroiliac screws using a novel augmented reality-based navigation system: a pilot study. Int Orthop. 2016;40(9):1941-1947. 36. Choi H, Park Y, Lee S, et al. A portable surgical navigation device to display resection planes for bone tumor surgery. Minim Invasive Ther Allied Technol. 2017;26(3):144-150. 37. Cho HS, Park YK, Gupta S, et al. Augmented reality in bone tumour resection: an experimental study. Bone Joint Res. 2017;6(3):137-143. 38. Pettersson J, Palmerius KL, Knutsson H, Wahlstrom O, Tillander B, Borga M. Simulation of patient specific cervical hip fracture surgery with a volume haptic interface. IEEE Trans Biomed Eng. 2008;55(4):1255-1265. 39. Blyth P, Stott NS, Anderson IA. A simulation-based training system for hip fracture fixation for use within the hospital environment. Injury. 2007;38(10):1197-1203. 40. Vankipuram M, Kahol K, McLaren A, Panchanathan S. A virtual reality simulator for orthopedic basic skills: a design and validation study. J Biomed Inform. 2010;43(5):661-668. 41. Kovler I, Joskowicz L, Weil YA, et al. Haptic computer-assisted patient-specific preoperative planning for orthopedic fractures surgery. Int J Comput Assist Radiol Surg. 2015;10(10):1535-1546. 42. Kim Y, Kim H, Kim YO. Virtual reality and augmented reality in plastic surgery: a review. Arch Plast Surg. 2017;44(3):179-187. 43. Vavra P, Roman J, Zonca P, et al. Recent development of augmented reality in surgery: a review. J Healthc Eng. 2017;2017:4574172. 44. Sauer IM, Queisner M, Tang P, et al. Mixed reality in visceral surgery: development of a suitable workflow and evaluation of intraoperative use-cases. Ann Surg. 2017;266(5):706-712. 45. Douglas DB, Wilke CA, Gibson D, Petricoin EF, Liotta L. Virtual reality and augmented reality: advances in surgery. Biol Eng Med. 2017;3(1):1-8. 46. Tepper OM, Rudy HL, Lefkowitz A, et al. Mixed reality with HoloLens: where virtual reality meets augmented reality in the operating room. Plast Reconstr Surg. 2017;140(5):1066-1070. 47. Bourdel N, Collins T, Pizarro D, et al. Augmented reality in gynecologic surgery: evaluation of potential benefits for myomectomy in an experimental uterine model. Surg Endosc. 2017;31(1):456-461. 48. Hekman MCH, Rijpkema M, Langenhuijsen JF, Boerman OC, Oosterwijk E, Mulders PFA. Intraoperative imaging techniques to support complete tumor resection in partial nephrectomy [published online May 12, 2017]. Eur Urol Focus. doi: 10.1016/j.euf.2017.04.008. 49. Ntourakis D, Memeo R, Soler L, Marescaux J, Mutter D, Pessaux P. Augmented reality guidance for the resection of missing colorectal liver metastases: an initial experience. World J Surg. 2016;40(2):419-426. 50. Rouze S, de Latour B, Flecher E, et al. Small pulmonary nodule localization with cone beam computed tomography during video-assisted thoracic surgery: a feasibility study. Interact Cardiovasc Thorac Surg. 2016;22(6):705-711. 51. Diana M, Soler L, Agnus V, et al. Prospective evaluation of precision multimodal gallbladder surgery navigation: virtual reality, near-infrared fluorescence, and X-ray-based intraoperative cholangiography. Ann Surg. 2017;266(5):890-897. 52. Souzaki R, Ieiri S, Uemura M, et al. An augmented reality navigation system for pediatric oncologic surgery based on preoperative CT and MRI images. J Pediatr Surg. 2013;48(12):2479-2483. 53. Faiella E, Frauenfelder G, Santucci D, et al. Percutaneous low-dose CT-guided lung biopsy with an augmented reality navigation system: validation of the technique on 496 suspected lesions. Clin Imaging. 2017;49:101-105. 54. Guimarães MD, Chojniak R, Gross JL, Bitencourt AG. Predictive success factors for CT-guided fine needle aspiration biopsy of pulmonary lesions. Clinics (Sao Paulo). 2009;64(12):1139-1144. 55. Grasso RF, Faiella E, Luppi G, et al. Percutaneous lung biopsy: comparison between an augmented reality CT navigation system and standard CT-guided technique. Int J Comput Assist Radiol Surg. 2013;8(5):837-848. 56. Fritz J, U-Thainual P, Ungi T, et al. Augmented reality visualization using image overlay technology for MR-guided interventions: cadaveric bone biopsy at 1.5 T. Invest Radiol. 2013;48(6):464-470. 57. Leveridge MJ, Finelli A, Kachura JR, et al. Outcomes of small renal mass needle core biopsy, nondiagnostic percutaneous biopsy, and the role of repeat biopsy. Eur Urol. 2011;60(3):578-584. 58. Gellert LL, Mehra R, Chen YB, et al. The diagnostic accuracy of percutaneous renal needle core biopsy and its potential impact on the clinical management of renal cortical neoplasms. Arch Pathol Lab Med. 2014;138(12):1673-1679. 59. Racadio JM, Nachabe R, Homan R, Schierling R, Racadio JM, Babic D. Augmented reality on a C-arm system: a preclinical assessment for percutaneous needle localization. Radiology. 2016;281(1):249-255. 60. Li Q, Huang C, Lv S, Li Z, Chen Y, Ma L. An human-computer interactive augmented reality system for coronary artery diagnosis planning and training. J Med Syst. 2017;41(10):159. 61. Jeon Y, Choi S, Kim H. Evaluation of a simplified augmented reality device for ultrasound-guided vascular access in a vascular phantom. J Clin Anesth. 2014;26(6):485-489. 62. Li L, Yu F, Shi D, et al. Application of virtual reality technology in clinical medicine. Am J Transl Res. 2017;9(9):3867-3880. 63. Fritz J, U-Thainual P, Ungi T, et al. Augmented reality visualization with use of image overlay technology for MR imaging-guided interventions: assessment of performance in cadaveric shoulder and hip arthrography at 1.5 T. Radiology. 2012;265(1):254-259. 64. Fritz J, U-Thainual P, Ungi T, et al. MR-guided vertebroplasty with augmented reality image overlay navigation. Cardiovasc Intervent Radiol. 2014;37(6):1589-1596.